What bothers more than the unimaginatively rehashed template that Harris Jayaraj uses for Theeyae Theeyae is the sub-par effort from the singers. Have never been a fan of Franco who is the lead singer here, but even others (and there is a fair number of them – Sathyan, Aalap Raju, Charulatha Mani, Suchitra) seem off colour, Aalap Raju seeming to be the only exception. The arrangement, as said before, sees the composer paying tribute to his own older compositions, most prominent being the revisit of the opening hook of God Rest Ye Merry Gentlemen which he had more commendably adapted for Edho Ondru in Laysa Laysa. HJ bounces right back with Kaal Mulaitha though, with a thoroughly engaging Russian-flavored orchestration (is that stringed instrument a balalaika? Nice touch, if yes). Javed Ali and Mahalaxmi Iyer are brilliant with their singing, and given the way the lines go that is saying something. The chorus is equally fab. With Naani Koni we are back in familiar territory, Harris Jayaraj’s trademark breezy acoustic guitar-based arrangement with some techno embellishments. He gets a top notch set of singers for this though – Vijay Prakash, Shreya Ghoshal and Karthik – and that works for the song. No such reprieve for Rettai Kathirae however, barring an approximately 19 second violin piece in the second interlude, the song is a clutter which no amount of exuberance from Krish, M K Balaji or Mili Nair can mitigate. Yaaro Yaaro is better off, with Karthik’s soulfulness and engaging interludes from the composer, though the monotony of the tune gets to you by the end. 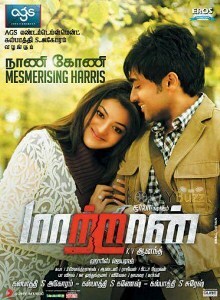 Pretty much like their previous outing together, Harris Jayaraj produces one exceptional song for K V Anand in Maattrraan and the rest is average. 6.5 is quite over to this album.this and h.j’s previous one ok ok were real craps.